Pears and almonds have a natural affinity for one another, and this cake lets it shine, says gluten-free blogger Carol Kicinski. The cake is amazingly buttery, even though it is completely dairy-free and does not even use a dairy-free butter substitute. It’s best served warm. Preheat the oven to 350 degrees. Lightly spray a 9 or 10 inch springform pan with gluten-free nonstick cooking spray. Cut a circle of parchment to fit the bottom of the pan, place in the pan and spray it lightly with more cooking spray. Peel and core the pears. Chop three of the pears roughly and slice the fourth into about ¼-inch slices. 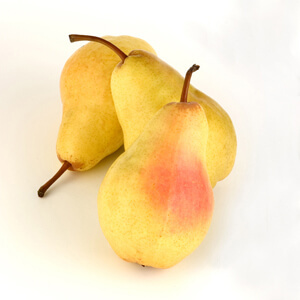 Take the chopped pears and put in a small, microwavable bowl with the lemon juice and 2 teaspoons of sugar. Cover and microwave on high power for 4 minutes. (Alternatively you can cook on the stove for 10 minutes over medium heat in a covered saucepan.) Mash the pears into a coarse puree with a fork or wooden spoon. Let cool. Put the almond meal and 1 ¾ cups of sugar in a food processor and give it 4 or 5 long pulses. Add the eggs, 1 teaspoon of vanilla extract, and the cooked pears and puree the mixture. Pour into the prepared pan. In a small skillet, heat the agave nectar or honey with the oil, stirring to mix until the mixture starts to bubble. Take off the heat and stir in the remaining ¼ teaspoon of vanilla. Add the pear slices and toss gently to coat. Sprinkle the sliced almonds over the top of the cake. Add the pear slices in a spoke configuration and spoon the agave nectar or honey/oil mixture over the top of the cake. Bake for 45–55 minutes or until the cake is nicely browned and a toothpick inserted into the center comes out clean. Check the cake after about 35 minutes; if it is browning too much, place a piece of foil over the top. Let the cake cool in the pan for about 30 minutes, then remove the sides of the pan and transfer to a serving platter (removing the parchment is optional, but recommended).